This article is a short summary of Paper Airplane Chase. The logo of Paper Airplane Chase. 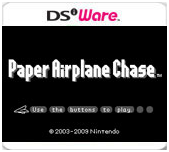 Paper Airplane Chase (released as Paper Plane in Europe) is a DSiWare game, released as a launch title for the Nintendo DSi Shop in late 2008 in Japan, and was later released internationally in 2009. The game is a spin-off of the WarioWare series, being a remake of the "Paper Plane" microgame in WarioWare, Inc.: Mega Microgame$! Fly a paper plane past obstacles, & go for a high score! In Paper Airplane Chase™, glide your virtual paper plane through an increasingly tricky slalom course. Take it slow in Endless mode or zip through several Time Attack courses. The two-player Race mode allows friends to race each other using a single Nintendo DSi system. Basic gameplay involves the player controlling a paper airplane flying down a tower, using the D-pad to move the plane from side to side and avoid obstacles. The game features three modes. In Endless Mode, the player must fly down for as long as possible to earn a high score. In Time Attack mode, the player must finish a course as fast as possible. Finally, in multiplayer mode, two players use the same system to race each other to the finish, one player using the D-pad while the other player uses the A and B buttons.